If your home needs an air conditioning system but not the messy duct work of a building-wide install, mini split units in each room offer the best solution for you. This is from an economic and asthetic standpoint, which covers most areas. There are some pretty compelling reasons why this is the case, as we shall see as I focus on why this cooling system configuration could just be your best choice for your home and your family. What is a Mini Split AC? This type of AC system is so called because it comprises two devices, effectively splitting the workload between the cooling unit which is installed inside the room and the condenser unit, which is installed on the outside. Each does a specific job and the positioning is important, as we will now see as I explain why they're mounted in this way. The internal unit is the air conditioner, which takes room temperature air, passes it through a refrigeration process similar to the way your fridge keeps its interior cold and expels a cold breeze back into the room. The exterior unit is there to extract the unwanted hot, moist air that is created by the AC as a by-product of the refrigeration process and exhaust it (harmlessly) to the outside atmosphere. To get a better understanding of exactly what the process is that's going on under the "hood" of the appliances, I'll explain how they work and why. Like a domestic fridge, the AC unit compresses a refrigerant gas which chills it. The gas fills a lattice of narrow pipes which form a kind of very cold radiating surface. Air is blown across this cold surface which is, in turn, chilled. That's the cold breeze that is sent into the room by the unit's fan. As for the compressor and its associated mechanisms, they give of a lot of heat to compress the gas. That heat, along with a lot of the moisture that is in the hot air is sucked out of the unit through a pipe connected to the condenser unit outside the building. That way, only cold, dry air is expelled into the room that you want to feel nice and comfortably cool in! Since the two units are mounted fairly close together on opposite sides of an external wall, the only connection between the two is a pipe which is fed through a small aperture in the wall right behind (and hidden by) the internal AC unit. That means there is no need for any ugly ducting to be installed, so all you see inside is the AC unit mounted high on the wall. This creates a fairly pleasant look to a room since the main unit is high up and out of the way. Unlike a portable air conditioner, which takes up some floor space, the minisplit is permanently connected to the external extracting unit through the wall so there is no ugly venting hose visible. Lastly as initially mentions, unlike a whole building AC system, there is no duct work to carry the cold breeze to every room and extract the hot exhaust top the outside. The extraction pipe is concealed behind the interior unit and goes straight out through the wall. With some installations, the exterior condenser/extractor unit is mounted directly adjacent to the internal unit, so the pipe that directly connects the two is completely concealed outside as well. Where this is not possible, the condenser can be mounted lower (or higher) on the wall, placed on a balcony or terrace or very large units can be sited on a slightly raised platform mounted on the ground nearly. The system is efficient and can actually be quite economical when used properly. Because each room has its own individual (and independent) AC unit, it can be turned off when the room is unoccupied, thus saving energy. The thermostat, timer and various operational options are controlled via a remote control making it very easy to operate. To save money, you can have a family room kept nice and cool where everyone gets together while the rest of the house that is unoccupied isn't wasting energy to keep cool for no reason. If someone wants to go to another room, they simply turn on the unit as they enter and immediately, the cold breeze starts pumping out and the room is cooled very fast. 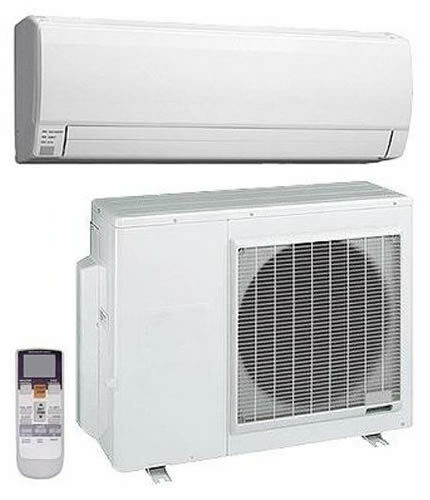 For more information from a government resource, go here: http://energy.gov/energysaver/ductless-mini-split-air-conditioners. As the author of this article, I have this setup in my own home and personally speaking, it's the best system I've every used!